All quiet for a month and them bam two fantastic shows set to open the same week and even the same night!! We have already mentioned the Bast opening this thursday and also opening in central London is Weekend Warrior. 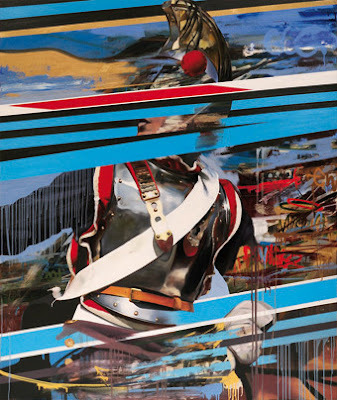 Weekend Warrior at Lazarides Gallery will showcase new works by Conor Harrington. The show will feature paintings made from oil and aerosol paint alongside a series of new charcoal drawings. Central to his oil canvasses is the male figure, representing the masculinity that is a commonplace of urban culture. WEEKEND WARRIORS explores the world of historic re-enactment as illustrated above (Horsepower, 2007), where men dress up at the weekends as warriors, generals and emperors to live out their escapistfantasies as heroes and supermen. The Napoleonic era was a time of great upheaval when men went into battle in uniforms dripping with gold as symbols of power and wealth, almost turning the battlefield into a 19th century catwalk. Similarly, in today’s bling culture, the urban male has the same preoccupation with gold as a symbol of their power, wealth and glory. However, Harrington does not aim to remake historic paintings – his work focuses on the 21st century western world, and masculinity and artifice are the driving forces in his work. Rather than emphasizing wealth and valour, he looks to highlight the pretense and allusion tot hese qualities within contemporary society. Another show definatly not to missed.